So far, I've tried to stay away from discussing my actual work in these posts. As I settle in to the ebb and flow of life down here and things become routine, I'll probably have to include occasional posts about work to fill the gaps. First up, a bit about the less-cerebral work of a cosmologist. Most of the time, my job is a desk job. Generally speaking, I sit at a computer and analyze data, then try to fit the results into a larger picture of how the universe operates. I also spend a fair bit of time working on equipment, trying to improve stability or performance. Up north, that would mean time in lab, developing and testing new detectors. Down here, that means keeping the telescope going. 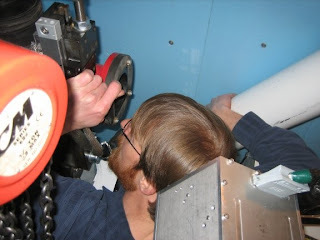 Most of the sensitive equipment in SPT is located in the "receiver cabin", a large room-sized box held on the end of the boom, into which the primary 10m mirror focuses light. 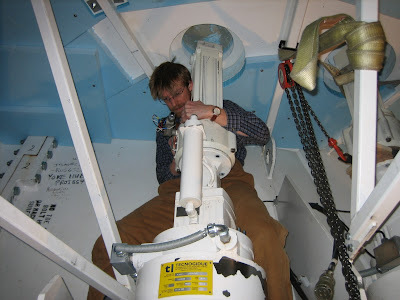 To work on anything in the receiver cab, a large 3 ton section of the roof rolls back and allows the telescope to "dock" the receiver cab against the control room. The roof was supposed to be motorized, but people are more reliable than motors, so we use a pulley instead. 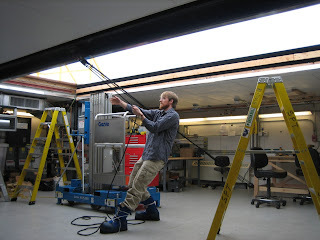 Some tests we have been doing lately required moving the telescope by hand. It's a half-million pounds of steel that has to be moved, so hand-driving isn't the easiest task under ideal conditions. Actual conditions require you to wedge yourself into small spaces and work around sheets of metal so cold they burn at a touch. Any large and complex system will invariably have failures or problems in one of its many many subsystems, and figuring out which one failed and how is actually one of the joys of this work. Of course, sometimes it requires you to wedge yourself into cracks not quite wide enough to let you inhale, 30' above the floor, while you disassemble and rebuild a motor with a blown coupling, but that's all part of the job. Physics (cosmology at least) can be a surprisingly physical field of study.